From Tech Munch in NY to Food.Curated. Back in May of 2012, I had the pleasure of meeting Liza de Guia (AKA Skeeter), the documentary food filmmaker, at a Tech Munch conference in New York. As Founder and Chief Storyteller of Food.Curated., Liza was a compelling speaker and I approached her to consider visiting the Berkshires to learn more about the local food scene. After many months of tempting culinary possibilities and correspondence via email, we were able to convince Liza to pay us a visit. Storytelling is Liza’s passion and it is her passion that puts her in touch with interesting and fascinating people in the food world – people who fly under the radar, who devote 15-plus hour days to creating something that makes them happy. They want others to enjoy what they put their heart into. Liza uses her craft to support these food obsessions and visually captures behind-the-scenes stories to help get them noticed. She enjoys putting these dedicated foodmakers on the map a little more and playing a part in their discovery. We invited Liza to the James Beard House in March to dine at The Berkshire Cure-All Dinner featuring seven chefs from the Berkshires. This was the fourth year Brian Alberg, Executive Chef and Food & Beverage Director at The Red Lion Inn, invited a group of like-minded chefs to travel to the James Beard Foundation in New York City to present a farm-to-table dinner featuring foods harvested in the Berkshire region. Liza got to meet many of the innovative Berkshire chefs working this dinner and was inspired to learn more about what we do here. 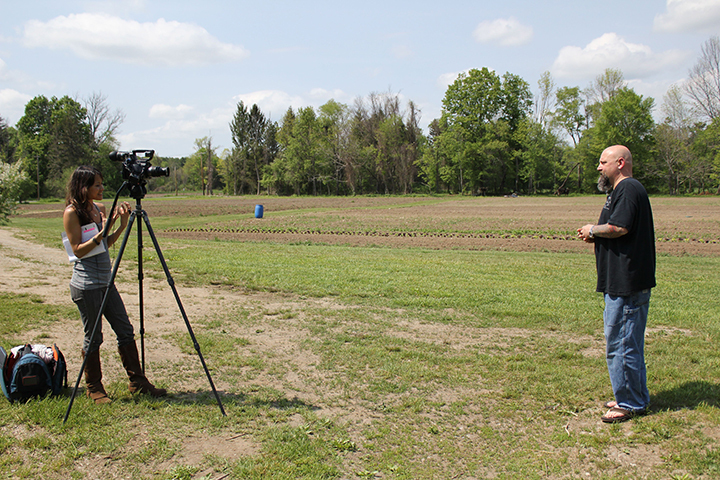 We had the pleasure of hosting Liza in mid-May while she filmed three food stories for her web channel Food.Curated. She spent four days shooting — one with Chef Brian Alberg of The Red Lion Inn in Stockbridge, and then went on to interview Chef Stephen Browning and Owner Mark Firth of Bell & Anchor and Chef-owner Jeremy Stanton of The Meat Market, both located in Great Barrington. Mini-documentaries featuring our well-loved Berkshire chefs will be coming soon. Follow Liza on Twitter to learn more about where she is and what she is doing. Special thanks to The Red Lion Inn and The Briarcliff Motel in Great Barrington, MA, for hosting Liza during her stay.